Low self-esteem? Are you feeling unworthy or have you lost your sense of identity? Do you constantly compare yourself to others and often feel inferior? Do you feel insecure, worry a lot about what others think of you, or fear rejection? Are you riddled with self-doubt, overly self-critical or even self-loathing? How much unhappiness are you experiencing? To what extent is it impacting the quality of your relationships? How much does this hold you back in life? Well I really do understand how you feel; for many years I battled with constant self-doubt and I felt as though I was a complete failure! And I lacked the confidence to make any changes in my life as I feared rejection and worried too much about what everyone else would think. I felt so ‘stuck in a hole’ and I didn’t know how to get out of it, and I was in and out of depression for many years as a result. I was lucky enough to finally find some great help. I then had this huge desire to help others who suffer just like I did. So after many years of studying human behaviour and helping people like yourself, I have the passion and experience to help you get out of ‘your hole’…and you can! Here is a truly unique program that has helped hundreds of people with low self-esteem and low self-worth. Building self-esteem is the first step towards your happiness and a creating a better life! 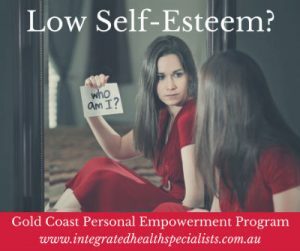 Low self-esteem refers to the overall negative opinion a person has of themselves, such as personal views or beliefs that they are inadequate, inferior, not good enough, unworthy, unlovable or incompetent. Low self-esteem occurs when you compare yourself to other people, and you feel inferior to them. You may often put other people’s desires over yours; perhaps you are a ‘people pleaser’? And your inner critic; that constant voice of disapproval inside of you causes you to doubt yourself at every turn lowering your self-esteem even further and creating a negative cycle, this often causes unhappiness, depression and deep insecurity. But it’s your self – perception that makes you feel inferior to others and this is created from your limiting beliefs, psychological patterns and mindset. Habits in both our thinking and behaviours are merely pre-conditioned ways of responding to certain triggers or situations. So the key is to look at what negative patterns you have running in your life and together we can change these patterns, both at a conscious and subconscious level to break the negative cycle and start rebuilding your self-esteem. Determine the underlying psychological patterns that are keeping you in a low self-worth cycle. Firstly we will work with your conscious mind; increasing your conscious awareness of your thoughts, emotions, and patterns of behaviour. Here we will challenge your current limiting beliefs and perceptions that are holding you back from being the best you can be! We will then work directly with your unconscious mind. Inner conflict occurs when your conscious mind and your unconscious are not aligned. What goes on in your unconscious mind governs how you feel and as a result how you behave! We work directly with your unconscious mind using techniques like Hypnotherapy, Neuro Linguistic Programming (NLP) and Emotional Freedom Techniques (EFT). By the end of your 14 week program you will see yourself and others in a completely different way – guaranteed! This program is absolutely life-changing, and we are so confident that we offer a full 100% money back guarantee! If you attend all scheduled appointments and complete all the set tasks, and you are not satisfied at the end of your program, we will refund your money in full! Feeling different or like the odd one out, at home or at school. Because our opinions of ourselves are usually well-formed from early childhood, they are more often than not biased and inaccurate because they were formed from on a child’s-eye view. Our opinions were also most likely formed from our interpretations and misunderstandings about experiences, because we had no adult knowledge or understanding of the full context of what was really going on. Although these beliefs may be misinterpreted, unhelpful or outdated now, they originated from a time when they made sense to us given what information we had at the time. Unfortunately once this faulty view of self is formed, it continues to impact the child’s ongoing experiences and interpretations in life, as it becomes the child’s future reference point. This is because beliefs are maintained and strengthened by what is known as biased thinking. This means that weight is given to anything that is consistent with your current beliefs, and you discount anything that is not. This is how beliefs become reinforced over time, and the beliefs you have about yourself often appear to be statements of fact, although in reality they are only opinions. Our beliefs directly impact our feelings and our behaviours; when negative beliefs and thoughts are prevalent, it adversely affects the way we behave, how we feel, the choices we make, and how we react to situations in life. Over time this can lead to really low self-esteem which can directly impact the quality of a person’s life in many ways. Unfortunately low self-esteem may even lead to serious mental health issues such as anxiety disorders, depression, eating disorders, drug and alcohol abuse, self-harming and even suicide.